The case was brought by pro-bono lawyer Winyat Chatmontree last month to disqualify Gen Prayut Chan-o-cha from the contest. Prayut was a state servant and should not be qualified for the nomination, the lawyer argued. The EC said the nomination was in line with the law, without giving an explanation. The ombudsman last week issued the same ruling saying Prayut was not a state servant after coming to power via a “temporary” five-year power seizure. The﻿ ﻿EC said the nomination was in line with the law, without giving an explanat﻿io﻿n﻿. That’s because there is no explanation. Prayut is either one or the other. He can’t be both and none at the same time. Absolutely criminal. Yet here they are, getting away with it in broad daylight, as no one seems to have the wit or the gumption to call them out for the blatant and hysterical hypocrisy and fiction that it is. How the Head of State, temporary or otherwise cannot be considered a state servant is beyond me. Still, there is rules and there is junta rules, and junta rules outweigh everyone elses opinion. No surprise there...it's pathetic. The only thing that can ever change Thailand is economic influences from outside. I hope it happens sometime. I wonder how hard and how long the Electoral Commission laughed before making their ruling? 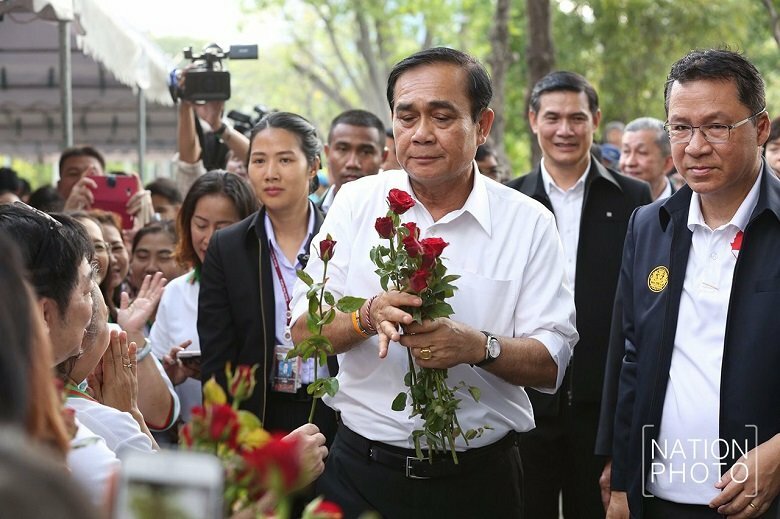 The Election Commission (EC) has ruled that the Palang Pracharat party’s nomination of General Prayut Chan-o-cha as its prime ministerial candidate is legitimate. An EC press release today said that the commission had considered a petition filed by a lawyer for the disbanded Thai Rask Chart party Mr. Winy at Chartmontri, challenging the legitimacy of the nomination of Gen Prayut as the Palang Pracharat party’s prime ministerial candidate. The EC unanimously agreed that the Palang Pracharat’s nomination was legal and in line with Sections 88 and 89 of the Constitution and Sections 13 and 14 of the law on the election of MPs. "...The Election Commission (EC) has ruled that the Palang Pracharat party’s nomination of General Prayut Chan-o-cha as its prime ministerial candidate is legitimate..."
I am stunned down to my socks!!! WOW! WOW! WOW! "...Earlier, the Ombudsman’s Office has ruled that Gen Prayut, in his capacity as the Prime Minister and head of the National Council for Peace and Order, is not an “other state official” and, hence, can stand as a prime ministerial candidate. The latest ruling by the EC has cleared the Prime Minister of all the legal challenges to his candidacy..."
Phew!!! I mean... JUST WOW!!! WOW! WOW! WOW! I did NOT think that the EC would clear him; I mean... Did anyone see that coming? Anyone? Anyone? I need to sit down; the shock of this decision has left me sooooooo stunned that I am gasping for air. or maybe a euphemism, "content development"
Where does he draw his salary from? So a previous legal nominatiom gets a party dissolved, but this illegal nomination results in no punishment. Thanks for clarifying....but just the same, take your medicine and calm down. 1st world countries seemingly do nothing to act against the dictator, I wonder why? Weapons of mass distruction plus the shameful war that followed spring to mind, as do many other interventions against terroists and dictators by so called concerned governments. Was the war on 'mass weapons of distruction' simply about unlawfully taking the spoils of war, such as the bounty of gold and oil, and in the process, the loss of lifes that sadly took place on all sides concerned? Are 1st world countries turning blind eyes because of where Thailands is located geographically, being non communist and mainly buddist, boardering on countries considered threats to the west? Why bother with a vote? Which ever way it goes, the miltary will probably win and if they do not, yet another forcefull take over will no doubt be actioned as it has done on numerous occassions since the 1930s. I maybe be missing something, but is Thailand run by an unelected government without a democratc vote? Is that not undemocratic? If I am correct with my point of view, that makes the leader a dictator? How can a dictator lawfully run as a candidate? Are not dictators considered threats and criminals? I think Im missing something here. Oh yes, the double edged sword of so called democracy. It's in line with the law he made.